This is my son’s site, filled with his posts; but I am writing this one post. 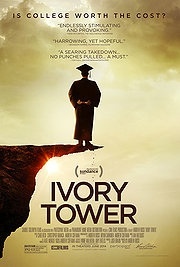 While Lane was on his third assignment of the day; I attended the documentary film “Ivory Tower”, a work that asks the question of whether a college education is worth the high cost, especially when students graduate with massive debt. The film bounced between the lofty rhetoric, cost and promise of elite universities; less selective, but often similarly priced colleges as well as attempts to create online alternatives. The writer and director Andrew Rossi, worked hard to present a fair look at a diverse selection of institutions and highlighted the very real threat and burden connected to student loans, but the scope was so large that the film lacked a cohesive message. Rossi, begins the film with his focus set on the top-tier elite schools, those most often connected with the term “Ivory tower,” addressing their cost and selectivity, but devoted much of that segment to the story of a previously homeless, likable AfroAmerica freshman. His story was inspiring, and following him through his 4 years at Harvard might have made an interesting film; however here it seemed either too much or not enough. The story surrounding Cooper Union’s decision to walkaway from their 150 year commitment to providing free education after extravagant building and risky financial moves left them in debt, again could have stood in its own. I had similar thoughts throughout the film as we were brought into compelling stories, yet deprived of an over-riding narrative or any call to action. be echoing the “tech-as-savior” ideology but then offered data that showed the dismal results of online education. Ok, I should openly admit that I am one that “Drank the cool aid.” My wife and I began paying tuition when Lane was 3 years old and upon graduation of high school had already invested a sum in excess of $250,000 on private school. While there are past purchases that I question, such as a used 911 convertible that I drive,maybe, 400 miles/year; but I have never second-guessed the sacrifices we made to send Lane to private schools. I’m not suggesting that kids can’t get a first-rate education at public schools ,and some of the brightest, most successful and driven of Lane’s friends stand as proof. There is no such thing as “The best school” just the school that’s best for their child. but I do believe that combining really smart hard-working kids with small class sizes, top professors and state-of-the-art facilities will make for a great school. So while I agree with the films basic contention that the money spent getting a college degree should open doors worthily of the investment and that rising costs and resulting debt challenges the notion that every dollar spent on college is a dollar well spent; I still believe that classic model of education continues to be a solid choice. In short the film asked interesting questions but failed to connect the dots to lead us to an answer.